The term ‘trigger point’ was coined in 1942 by Janet Travell after extensive research into the causes and referral patterns of chronic soft tissue (myofascial) pain. Trigger point therapy has since become invaluable in the treatment of chronic pain. Travell realised, through hands-on research that the majority of chronic pain was due to specific points in the soft tissue (muscles, fascia, tendons, ligaments) which caused local, and also importantly, referred pain. She found you could scan specific body areas/muscles looking for active trigger points which would re-create the client’s pain pattern when pressed. These points were often in a different place to where the client perceived the pain, but when treated over 4-6 treatments would still alleviate the pain. She also found that trigger points in specific muscles would give similar referral patterns and began to chart these myofascial pain patterns graphically. Today therapists can use these charts to learn common referral patterns, helping them to quickly identify the area/s causing a client’s pain. There are many theories suggesting what causes trigger points but what is important is that an estimated 80% of chronic pain is caused by them, and finding and treating them will alleviate this pain. As trigger point pain often does not refer along a nerve route, many doctors and some manipulative therapists have been confused by presented pain referral patterns. This is because it is often assumed nerve root pressure or other pathology is involved, when more commonly they were observing referred trigger point pain. My trigger point therapy training is extensive. I have highly developed palpation skills and am able to quickly locate, and accurately treat active trigger points. 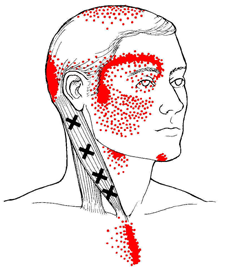 Treatment techniques include static pressure, particularly useful for large/muscular trigger points. Cross fibre friction can be effectively used for knotty, calcified or fibrous trigger points. However, a great leap forward in trigger point therapy’s effectiveness occurred when therapists began to use myofascial techniques to treat trigger points. Myofascial release practitioners, such as myself, believe that the majority of trigger points are due to adhesions in the bodies strong connective tissue (fascia). These can pull on sensitive tissue causing local or referred pain. Gently stretching out or breaking of these adhesions using myofascial techniques leads to quicker, longer lasting results than conventional trigger point therapy. Trigger point therapy works particularly well when followed by deep tissue massage and/or advanced stretching.